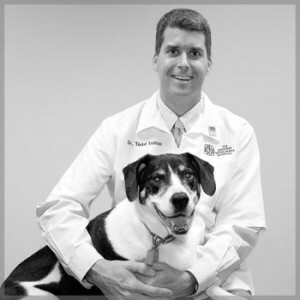 Dr. Todd Inman fell in love with the veterinary field after taking an animal nutrition course, while studying aerospace engineering. His love for animals and their well-being is the foundation of his philosophy. He honors his client relationships with respect, sharing personal experiences and being a part of the care decisions related to their pets. Comfort is always a priority and he looks for innovative ways to prevent and manage pain. Todd shares his home with his wife Laura, also a veterinarian, his son Luke, daughter Paige, and their 18 year old cat Sierra. When not at the hospital, he enjoys jogging, basketball, home renovations and flying quadcopters.